Opening hours: Shops are generally open from Mon–Sun between 9am - 1pm and 3pm - 7pm. Some shops are closed on Tuesdays or Wednesday. Banking hours are Tue - Sat from 9am - noon and 2pm - 6pm. Open: Mon - Sat 10am - 6pm, Sun and bank holidays 10am - 1pm and 2om - 5pm. 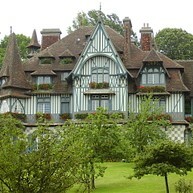 Summer is peak season for Deauville, but during the winter, life slows down and much of the action moves to neighbouring Trouville, a few minutes’ walk east. Here you will find a busy fishing port, lively Sunday market and quiet, winding streets full of sublime French charm. 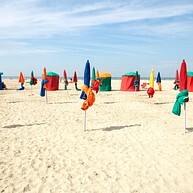 At Deauville’s 1400 metre-long beach many choose to rent one of the colourful parasols and keep to the sands, where celebrity spotting is the most popular activity. The beach has all the amenities and facilities you could want: seaside tennis, recreation clubs for children and teens, a swimming pool, thalasso spa and a water sports centre where you can rent boats and boards. Full of old world charm, this picturesque Anglo-Norman mansion was the residence for many visiting international dignitaries. You can view the interior’s luxury furnishings during guided tours in July and August. 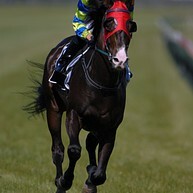 The regular thoroughbred horse races at this posh national racetrack are attended by the cream of the racing elite. Races are held throughout the entire year. The course also contains two polo pitches where top international teams come to play during the summer. The Hippodrome Deauville-Clairefontaine is the less pretentious of the two racetracks. 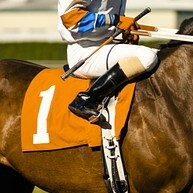 This racetrack hosts a greater variety of races during the summer. Go on a pony or horseback ride right on the beach. Riding lessons are available from the age of four, and even the two year olds can enjoy a handheld walk on a pony. The Casino building is a sight in itself, and the experience inside is exactly what one would expect from a high-class gambling establishment. Roulette, Black Jack and other card games along with jackpot machines are just some activities to choose from. Les Terrasses du Mini Golf is an 18-hole mini-golf course that is located just a few steps away from the beach and offers entertainment for the whole family.